Puncture wounds in the feet are common, and can lead to multiple problems if not treated appropriately. Sharp objects abound in our environment, and the skin on the bottom of the foot is not thick enough to avoid injury from these objects. Foreign objects pierce skin, and can bring bacteria into the interior of the foot by either being contaminated themselves, or by allowing bacteria to follow into the opening created by the puncturing object. Pieces or fragments of the object can also break off inside the foot, leading to pain, inflammation, and a chance of developing a deep infected abscess. Very small objects, like glass fragments, can become easily incorporated into the skin tissue and push deeper with the pressure of walking. Proper initial care is vital to preventing further complications from developing. The list of objects that are commonly extracted from foot skin is lengthy, and includes glass, needles, ceramics, wood or other plant-based splinters, nails, screws, small rocks, bone pieces, and carpet tacks. Each of these objects, just by being on the ground, pose an infection risk. Heavily soiled or rusty objects pose a threat of carrying the bacteria that can cause tetanus, a serious muscle disease. The first step that must be considered when suffering a puncture wound is to ensure that one's tetanus immunization is up to date. If full immunization has not been performed in the last five years, one must seek immediate treatment at either an urgent care center, emergency room, or primary care doctor (if on the same day as the injury) for tetanus immunization. Medical treatment of the puncture wound will then take place. If one's tetanus immunization is up to date, then self-care of the puncture wound should begin. The first step is to remove any visible foreign body pieces from the skin. This must be done carefully, and having the assistance of another helps. The objects must be removed in the exact opposite direction they take in entering the body. 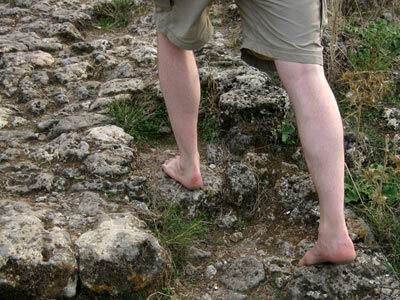 Any tugging or pulling of the object in a wider direction could lead to some of the object breaking off into the foot. The piece removed should be inspected, if a sharp edge is present the object was likely fully removed. A jagged or flat edge can possibly indicate that the object still has a piece remaining in the foot, assuming the object was not this shape to begin with. After the pieces are removed, the foot should be cleansed with warm, soapy water, and dried carefully. Antibiotic ointment and a band-aid should be used to cover all puncture sites. If the puncture is large and deep, immediate medical attention should be sought as sutures may be needed to repair the skin. Once the site is cleaned, and no further retained particles in the foot are suspected, one should monitor the site for redness, swelling, pain, or drainage. If these develop, the care of a podiatrist should be sought, or an emergency room if one is not available within 24 hours. If retained foreign material is felt through the skin, or if the puncture site has ongoing pain, a podiatrist needs to be seen as surgical removal of the retained material may be necessary. All diabetics who endure a puncture wound need immediate evaluation by the podiatrist as diabetic s are at a much higher risk for infection from a puncture wound, and may not necessarily feel if there is material still in the foot.